Disney's Magical Express | What's the Point? Welcome to the first stop aboard Magical Blogorail Red. Enjoy the ride as we discuss different types of Disney transportation. There was a discussion the other day on the Magical Blogorail Facebook page on what we deem the official start of a Walt Disney World vacation. Is it when you first go through the turnstiles? When you arrive at your resort hotel? When you see Cinderella Castle for the first time. For me, the official start of my Walt Disney World vacation is the moment I step foot on Disney's Magical Express. I am a terrible flyer, so I only start relaxing when I'm off the plane. Disney's Magical Express makes flying into Orlando International Airport so incredibly easy, it helps ease any stress. What's Disney's Magical Express? It's a free airport transportation and luggage service for Walt Disney World Resort guests. It allows you to bypass luggage pickup and head directly to your resort. How does it work? When you make your resort reservation, provide the Cast Member (or through the website) with your flight information. Don't know your flight information? You can add it later. Just remember, your luggage tags will be sent approximately three weeks before your vacation. Can't get your tags in time? It's still not a problem. You can pick up your own luggage and take it with you. Arrival at the Airport. When you arrive at your home airport, make sure each piece of checked luggage has a Magical Express luggage tag before checking them with your airline. This will be the last time you'll see your luggage until you are in your resort room later. Do not pack anything that you may need on the bus. I always pack my medication and a bathing suit in my carry on. On the bus. Welcome to your motor coach! Remember, there may be multiple stops, but you can expect a 30-40 ride. During this ride, you will be entertained with a video. Looking for a photo when you enter the Walt Disney World gates? Sit toward the front on the right side of the bus. Sit back and relax! Waiting for your luggage. Your luggage will arrive in approximately three hours. You do not need to be in your room to receive your luggage. Go about your magical vacation and have a great time! Departing Walt Disney World Resort. All good things must come to an end. The night before you check out, there will be a letter and vouchers delivered to your room which will list the pick-up time and place. It will be approximately three hours before your flight. Have any questions about Disney's Magical Express? Write to me in the comments section below. Also, feel free to share your opinion of this service. Few things are more jarring then the unwanted arrival of that dreaded return envelope. It always seems to come way too soon! The Magical Express is a fantastic service (even including the "Tragical Express" portion, on the way home)! I TOTALLY agree! And it always seems to head back to the airport too early, cutting away from my magic time :) PS- I'm totally stealing Tragical Express...that's awesome! So, I am a Disneylander, planning our first WDW vacation... Do they ask how many luggage tags you need or do they send you 1-2 per guest? How does that work? I would hate to be short luggage tags. Hey Becca! I can't wait to hear all about your first WDW trip! They typically send two per guest. If you do need more, you or your travel agent can request them by calling the DME number (866-599-0951) and they'll gladly send more. Just note: they aren't the quickest, so be sure to leave yourself at least a few weeks. We only flew to WDW once, but ME was so easy & convenient, I can't imagine arriving/departing any other way if you fly. I just wasn't sure if or how much to tip the driver. What do you recommend? I am a terrible flyer too! I just love the way the Magical Express helps you calm down and ease your way into your vacation.We just saw the new video when we went in January. Have you seen it? Which one do you like better. I totally agree! There is something magical, indeed, about stepping onto that Magical Express bus. It helps that it's so plush and comfy (after hours on a plane!) Then, they play Disney music and informational videos that get you geared up for your actual arrival. We love it! Of course, the return trip is never quite so magical, is it? You know, this is something that I don't think I've ever experienced at the Magic Kingdom! I need to be sure to take time out of our busy days and check this out next time we're there! Thanks for sharing! I usually tip the driver $1 per person and $1 per bag that they put under the bus. It's not a lot, but enough to say "thank you!" I haven't yet Lisa! We went to Disneyland this March and haven't been to Disney World since last September. How did you like it? YES! We did this once. We got stuck in Downtown Disney and couldn't get back to our resort in time. You definitely appreciate how helpful, comfortable and reasonable DME is when you are stuck in a cab for 35 minutes! It's definitely something special! Let me know how you like it! Love Magical Express - so easy and convenient! They pushed my patience by taking about 4 hours to get us our luggage last year, but still totally worth it - especially with small kids! 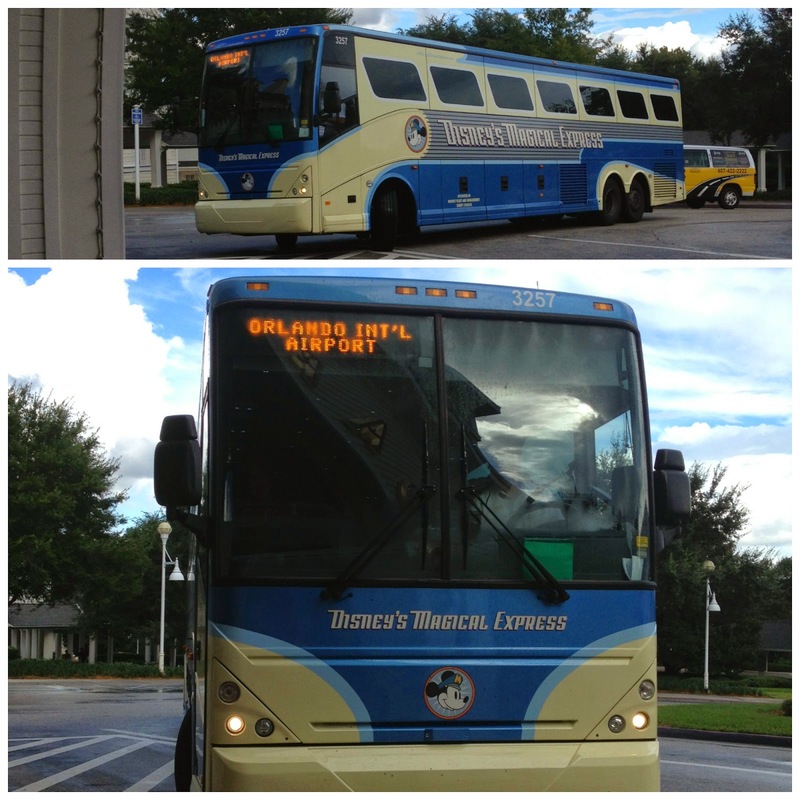 Magical Express is something that this Disney traveler has yet to experience! One day I will, if for no other reason than the experience. For me, though, to answer your question, the planning process is my anticipation for the vacation to come, but the moment we are in the car and driving to Walt Disney World, this is my official start to our vacation! Thanks for sharing such a great post! When I take my solo trips I always take Magical Express. It's one last thing I have to worry about and I can relax and enjoy the movies. This past week was my first experience with DME and it was such a great experience!! I especially love the fact you don't not have to deal with your luggage. I highly recommend the service.